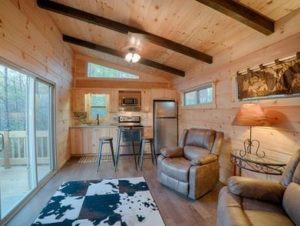 If you’ve been searching for a unique vacation rental in Lake Lure, then look no further than End of the Road Cabins. These tiny home cabin rentals offer a cozy and intimate setting in the beautiful Blue Ridge Mountain foothills. 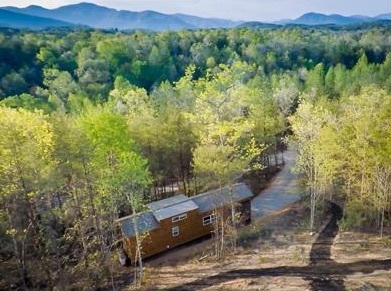 End of the Road Cabins are ideal for those looking to get away from the city, and is perfect for large group vacations! As an added bonus the rentals are pet friendly, so your furry friend can tag along on your vacation. The cabins are conveniently located near Lake Lure, Chimney Rock, and Tryon International Equestrian Center which provide a variety of fun activities for all ages. With amenities like these you’ll find yourself returning to this tranquil setting year after year. Don’t believe us? Take a look at these pictures, and get a glimpse of your dream vacation at End of the Road Cabins. End of the road Cabins are a great choice for those who are a fan of the tiny home movement or for those looking for a more intimate setting. Each rental offers a queen size bed and micro loft area, with a full kitchen and bath. The rentals also come with a lovely screened in porch and deck to enjoy the sights and sounds of nature. There truly is a lot to love about the mountain views you’ll discover at End of the Road Cabins. Bask in the breathtaking views from your cozy cabin or set off on a hike to view them at a higher elevation. Nearby Lake Lure and Chimney Rock also provide visitors with a scenic setting. These locations are perfect for adventuring, and exploring the great outdoors. If you’ve been looking for the perfect mountain getaway, we want to help. Our goal as real estate agents is to provide every one of our clients with the utmost in customer service. Have any questions about End of the Road Cabins or similar properties? Please reach out to us! We would love to give you a personal tour or provide you with more information about these charming vacation rental homes.